I have been slightly obsessed with Noodlehead Patterns lately. 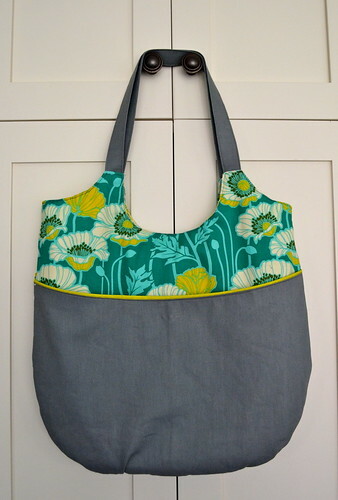 After my 241 tote I was dying to try the larger, Go Anywhere Bag. I have been wanting to make myself a new purse and bought some fabric from Joel Dewberry's Notting Hill line for that purpose. I've been dragging my feet cutting into it because I couldn't decide on a pattern. I am not a big purse kind of girl, but with a baby coming I want something big enough to stuff a little changing mat and things for a diaper change into it along with my stuff. 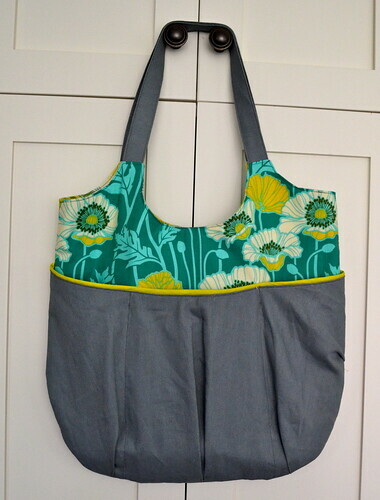 Excuse the bad instagram photo, but this was my first attempt at a new bag - the Multi Tasker Tote from Anna Maria Horner done up in various AMH fabrics, including velveteen for the main panels. While I love the size and feel of it, it is quite busy and bold for me to carry. You can't see much of them here, but the large padded handles in hot pink just put it a bit over the edge crazy for my taste. I also thought it might be a bit big. After a lot of internal debating I decided to take the plunge and try something new with the Go Anywhere pattern. As I've come to expect of Anna, it sewed up beautifully thanks to a great design and very clear instructions. I paired the Joel Dewberry print with some Essex linen in Steel. I made piping in Citrine from the Free Spirit Designer Solids collection (so amazingly soft and lovely, by the way). 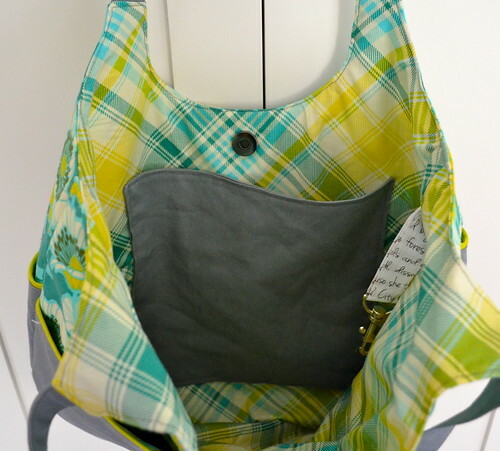 I love the plaid lining - Tartan in Aquamarine. This will definitely be coming with me to Quiltcon next week! I am wondering if I have time to sew up a matching wallet? Rachel's post today has me inspired. Eventually there will also be a coordinating roll-up changing pad and wet bags, but there is time for that. And in other news, a big shout out to my amazing Dad. He has come to the rescue yet again! While cooking shrimp I somehow flipped one out of the pan (in a very raw state) and into my downdraft vent which is built into my cooktop. With the help of various screwdrivers, serving utensils, wooden spoons used as wedges, a shop vac, chopsticks and a skewer he finally extracted the raw shrimp. I cannot tell you the joy I felt as the shrimp emerged from the depths under our cooktop, it had started to smell so bad in 24 hours that I was no longer able to walk into the kitchen. Hooray! And now I am off to figure out someway to better secure the screen cover to the downdraft in hopes that nothing ever falls into that hole again. 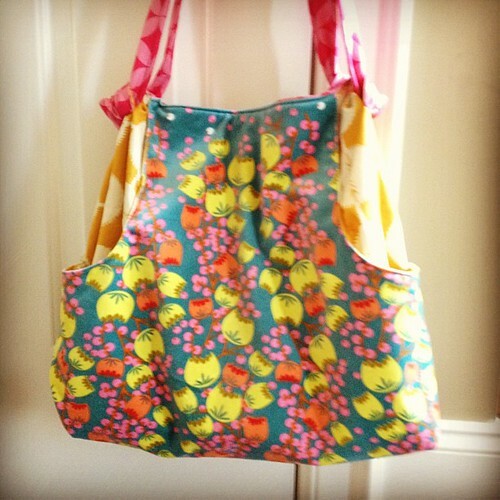 Adorable bag!! I think it will go anywhere with you and look great! Just saw you're going to QuiltCon - me too. Would love to me up! Super cute. Love those fabrics. I am in love with your bag!! It is really beautiful! !